Jyothishmathi Institute of Pharmaceutical Sciences, Beside LMD Police Station, Thimmapur, Karimnagar-505481, Telangana, INDIA. Aim: Screening of natural extracts is a focused intensive study that aims to find active principles sorted from plant resources both safe and environmental friendly. The present study was aimed to evaluate the antibacterial activity of direct crude extracts of Carica papaya leaves and Allium sativum cloves alone and in combination against multiple drug resistant strains. 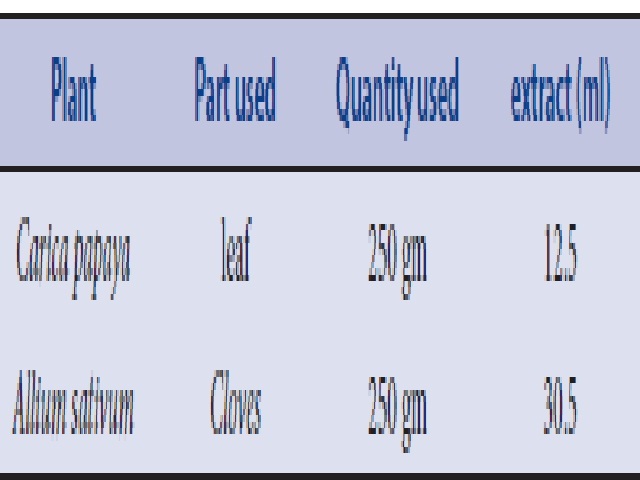 Methods: Two Gram positive (Staphylococcus aureus and Bacillus cereus), and three strains of Gram negative (Escherichia coli, Salmonella typhi and Pseudomonas aeruginosa) bacteria were used to evaluate the antibacterial activity of Carica papaya leaves and Allium sativum using Agar Disk Diffusion Method. Results: The results of this study showed that both extracts showed moderate antibacterial activity against the test bacterial strains and the potency of the extracts was increased when these two extracts were combined. Conclusion: These extracts directly can be used as natural alternative preventives to control various food poisoning diseases and preserve food stuff avoiding healthy hazards of chemically antimicrobial agent applications. Key words: Carica papaya leaves, Allium sativum cloves, crude extract, Antibacterial activity, Staphylococcus aureus, Bacillus cereus, Escherichia coli, Salmonella typhi, Pseudomonas aeruginosa. Lonkala S, A. Reddy RN. Antibacterial Activity of Carica Papaya Leaves and Allium Sativum Cloves Alone and in Combination against Multiple Strains. Pharmacognosy Journal. 2019;11(3):75.